VMware introduced a new storage feature in vSphere 6.0 which was designed as a flexible option to better handle certain storage problems. Cormac Hogan did a fine job introducing the feature here. 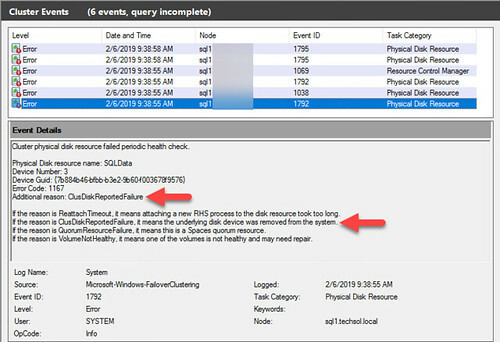 Starting with vSphere 6.0 and continuing on in vSphere 6.5, each block storage device (VMFS or RDM) is configured with an option called action_OnRetryErrors. Note that in vSphere 6.0 and 6.5, the default value is off meaning the new feature is effectively disabled and there is no new storage error handling behavior observed. This value can be seen with the esxcli storage nmp device list command. If vSphere loses access to a device on a given path, the host will send a Test Unit Ready (TUR) command down the given path to check path state. When action_OnRetryErrors=off, vSphere will continue to retry for an amount of time because it expects the path to recover. It is important to note here that a path is not immediately marked dead when the first Test Unit Ready command is unsuccessful and results in a retry. It would seem many retries in fact and you’ll be able to see them in /var/log/vmkernel.log. Also note that a device typically has multiple paths and the process will be repeated for each additional path tried assuming the first path is eventually marked as dead. Starting with vSphere 6.7, action_OnRetryErrors is enabled by default. If vSphere loses access to a device on a given path, the host will send a Test Unit Ready (TUR) command down the given path to check path state. When action_OnRetryErrors=on, vSphere will immediately mark the path dead when the first retry is returned. vSphere will not continue the retry TUR commands on a dead path. This is the part where VMware thinks it’s doing the right thing by immediately fast failing a misbehaving/dodgy/flaky path. The assumption here is that other good paths to the device are available and instead of delaying an application while waiting for path failover during the intensive TUR retry process, let’s fail this one bad path right away so that the application doesn’t have to spin its wheels. However, if all other paths to the device are impacted by the same underlying (and let’s call it transient) condition, what happens is that each additional path iteratively goes through the process of TUR, no retry, immediately mark path as dead, move on to the next path. When all available paths have been exhausted, All Paths Down (APD) for the device kicks in. If and when paths to an APD device become available again, they will be picked back up upon the next storage fabric rescan, whether that’s done manually by an administrator, or automatically by default every 300 seconds for each vSphere host (Disk.PathEvalTime). From an application/end user standpoint, I/O delay for up to 5 minutes can be a painfully long time to wait. The irony here is that VMware can potentially turn a transient condition lasting only a few seconds into a more of a Permanent Device Loss like condition. All of the above leads me to a support escalation I got involved in with a customer having an Active/Passive block storage array. Active/Passive is a type of array which has multiple storage processors/controllers (usually two) and LUNs are distributed across the controllers in an ownership model whereby each controller owns both the LUNs and the available paths to those LUNs. When an active controller fails or is taken offline proactively (think storage processor reboot due to a firmware upgrade), the paths to the active controller go dark, the passive controller takes ownership of the LUNs and lights up the paths to them – a process which can be measured in seconds, typically more than 2 or 3, often much more than that (this dovetails into the discussion of virtual machine disk timeout best practices). With action_OnRetryErrors=off, vSphere tolerates the transient path outage during the controller failover. With action_OnRetryErrors=on, it doesn’t – each path that goes dark is immediately failed and we have APD for all the volumes on that controller in a fraction of a second. To resolve the problem in vSphere 6.7, action_OnRetryErrors needs to be disabled for each device backed by the Active/Passive storage array. This must be performed on every host in the cluster having access to the given devices (again, these can be VMFS volumes and/or RDMs). There are a few ways to go about this. I don’t prefer that method a whole lot. It’s tedious and error prone. It could result in cluster inconsistencies. But on the plus side, a host reboot isn’t required, and this setting will persist across reboots. That also means a configuration set at this device level will override any claim rules that could also apply to this device. Keep this in mind if a claim rule is configured but you’re not seeing the desired configuration on any specific device. When a new claim rule is added, claim rules can be reloaded with the following command. Keep in mind the new claim rule will only apply to unclaimed devices. Newly presented devices will inherit the new claim rule. Existing devices which are already claimed will not until the next vSphere host reboot. Devices can be unclaimed without a host reboot but all I/O to the device must be halted – somewhat of a conundrum if we’re dealing with production volumes, datastores being used for heartbeating, etc. Assuming we’re dealing with multiple devices, a reboot is just going to be easier and cleaner. The bottom line here is there may be a number of VMware customers with Active/Passive storage arrays, running vSphere 6.7. If and when planned or unplanned controller/storage processor failover occurs, APDs may unexpectedly occur, impacting virtual machines and their applications, whereas this was not the case with previous versions of vSphere. In closing, I want to thank VMware Staff Technical Support Engineering for their work on this case and ultimately exposing “what changed in vSphere 6.7” because we had spent some time trying to reproduce this problem on vSphere 6.5 where we had an environment similar to what the customer had and we just weren’t seeing any problems. For more information about Microsoft’s policies for supporting software running in non-Microsoft hardware virtualization software please refer to http://support.microsoft.com/?kbid=897615. In addition, refer to http://support.microsoft.com/kb/957006/ to find more information about Microsoft’s support policies for its applications running in virtual environments. At any rate, here are some highlights of MSCS setup on VMware Virtual Infrastructure, and by the way, all of this information is fair game for the VMware VCP exam. hosts, then an additional network adapter is highly recommended. hosts, a separate network adapter is recommended. need an FC HBA (QLogic or Emulex). * Two virtual network adapters. * A hard disk that is shared between the two virtual machines (quorum disk). document, the system creates the associated virtual SCSI controllers. The prerequisites for clustering across boxes are similar to those for cluster in a box. private network, and one network adapter dedicated to the service console. private network, and one network adapter dedicated to the VMkernel. * Shared storage must be on an FC SAN. RDM or non‐pass‐through RDM). You cannot use virtual disks for shared storage. * You must use RDMs in physical compatibility mode (pass‐through RDM). (non‐pass‐through RDM) for shared storage. * You cannot have multiple paths from the ESX Server host to the storage. ESX Server 3.5 and ESX Server 3i. PCI slot for a third network adapter (or other device), if needed. support applications using SCSI‐3 persistent reservations. * Use LSILogic virtual SCSI adapter. * Use Windows Server 2003 SP2 (32 bit or 64 bit) or Windows 2000 Server SP4. VMware recommends Windows Server 2003. * Clustering is not supported on iSCSI or NFS disks. * NIC teaming is not supported with clustering. * The boot disk of the ESX Server host should be on local storage. * Clustered virtual machines cannot be part of VMware clusters (DRS or HA). reset the value in that case. A few days ago I posted some information on how to make VirtualCenter highly available with Microsoft Cluster Services. It’s fully supported by VMware. You probably already have a VI cluster in your environment you can leverage. Hit the ground running without spending the time to set up MSCS. Removing MSCS removes a 3rd party infrastructure complexity and dependency which requires an advanced skill set to support. Removing MSCS removes at least one Windows Server license cost and also removes the need for the more expensive Windows Enterprise Server licensing and the special hardware needs required by MSCS. Green factor: Let VCMS leverage the use of VMware Distributed Power Management (DPM). If you’re going to virtualize the VCMS, be sure you do so on a cluster with the necessary licensed options to support the benefits I outlined above (DRS, HA, etc.) This means VI Enterprise licensing is required (see the licensing/pricing chart on page 4 of this document). I don’t want to hide the fact that a premium is paid for VI Enterprise licensing, but as I pointed out above, if you’ve already paid for it, the bolt ons are unlimited use so get more use out of them. If your VCMS (and Update manager) database is located on the VCMS, be sure to size your virtual hardware appropriately. Don’t go overboard though. From a guest OS perspective, it’s easier to grant additional virtual resources from the four food groups than it is to retract them. If you have a power outage and your entire cluster goes down (and your VCMS along with it), it can be difficult to get things back on their feet while you don’t have the the use of the VCMS. Particularly if you’ve lost the use of other virtualized infrastructure components such as Microsoft Active Directory. Initially it’s going to be command line city so brush up on your CLI. It really all depends on how badly the situation is once you get the VI hosts back up. One example I ran into is host A wouldn’t come back up. Host B wasn’t the registered owner of the VM I needed to bring up. This requires running the vmware-cmd command to register the VM and bring it up on host B. Well, I missed the first few minutes of Monday Night Football, but everyone who reads (tolerates) my ramblings is totally worth it. When VirtualCenter was first introduced, many could make the argument that VC was simply a utility class service that provided centralized management for a virtual infrastructure. If the VirtualCenter Management Server (VCMS) was rebooted in the middle of the day or if the VC services were stopped for some reason, it wasn’t too big of a deal providing the outage didn’t interrupt a key task such as a VMotion migration or a cloning process. Virtual infrastructures are growing rapidly in the datacenter. The need for a functioning centralized management platform increases exponentially. Increased and more granular VC alerting capabilities are relied upon to keep administrators updated with timely information about the load and health of the VI. The introduction of more granular role base security extended Virtual Infrastructure Client or Web Access deployment to more users and groups in the organization increasing dependability on VC and visibility of downtime. The exposure of the VC API/SDK encouraged many new applications and tools to be written against VC. I’m talking about tools that provide important functions such as backup, reporting, automation, replication, capacity analysis, sVMotion, etc. Without VC running, these tools won’t work. The introduction of plugins. Plugins are going to be the preferred bolt on for most administrators because they snap in to a unified management interface. Obvious dependency on VC. The introduction of new features native to VC functionality. DRS, HA, DPM, VCB, Update Manager, Consolidation, snapshot manager, FT, SRM, etc. Like the bullet above, all of these features require a healthy functioning VCMS. The Virtual Datacenter OS was announced at VMworld 2008 and is comprised of the following essential components: Application vServices, Infrastructure vServices, Cloud vServices, and Management vServices. I don’t know about you, but to me those all sound like services that would need to be highly available. While it is not yet known exactly how existing VI components transform into the VDC-OS, we know the components are going to be integral to VMware’s vision and commitment to cloud computing which needs to be highly available, if not continuously available. VirtualCenter has evolved from a cornerstone of ESX host management into the the entire foundation on which the VI will be built on. Try to imagine what the impacts will be in your environment if and when VirtualCenter is down now and in the future. Dependencies may have waltzed in that you didn’t realize. A single VCMS design may be what you’re used to, but fortunately there exists a method by which VC may be made highly available on a multi-node Microsoft Cluster. This document, written by none other than my VI classroom training instructor Chris Skinner, explains how to cluster VirtualCenter 2.5. If you’re on VirtualCenter 2.0.x, follow this version of the document instead. Update: Follow up post here.